The (unfortunate) rise of Donald Trump running for President. The rise and rise of Donald Trump. 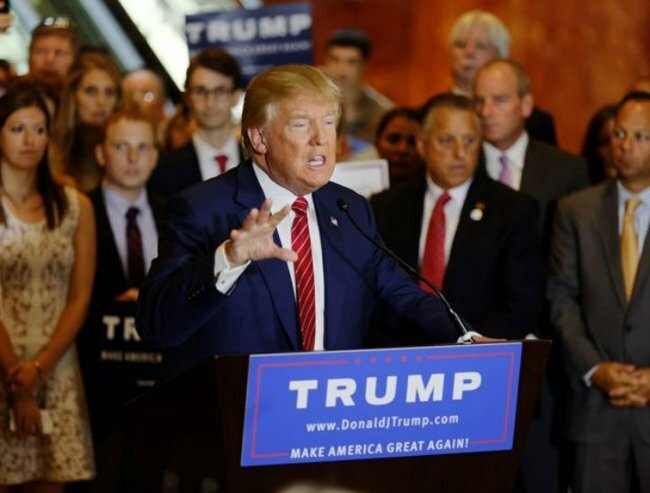 In June, real estate tycoon and television personality Donald Trump announced he was running in the Republican US presidential race. Many dismissed him, but within weeks he became the frontrunner in a field of 17 candidates. Annabelle Quince explores where Donald Trump came from, and why he is so popular with a large section of the American electorate. Donald Trump portrays himself as a self-made man, but his start in life was anything but humble. His grandfather came to America from Germany in 1885 and made his fortune supplying goods to the miners of the gold fields. His father, Fred Trump, followed suit, making his own fortune building low cost housing after WW1 and WW2 in Queens. Don Guttenplan, editor-at-large forThe Nation magazine, has followed Trump’s career for decades. It all began, he says, in ‘the part of New York that the tourists never want to go’. ‘In deepest, darkest Queens in Brooklyn, not the chic parts of Brooklyn but the interior, you see these brick high-rise buildings or fairly charmless tract housing,’ says Guttenplan. Gwenda Blair, who interviewed Donald Trump many times for her biography Donald Trump: Master Apprentice, explains that his childhood was both privileged and positive. Trump and his first wife, Ivana in the &apos;80s. &apos;There were five children. His father, by the time Donald was born in 1946, was quite successful. They lived in a 23-room house; they had a chauffeur and a maid. The kids were taken to their private schools in a limousine. So this was hardly a hard-luck story. They were already very well-to-do,&apos; says Blair. According to Guttenplan, New York was (and still is) a one-industry town—and that industry is real estate. Watch the video below where Trump says the Paris Terror Attack victims &apos;should have had guns&apos;. Trump was also able to tap into the fact that New York City wanted new building projects that weren&apos;t happening. His first deal was refurbishing a very dog-eared hotel right in the heart of downtown or midtown New York, next to Grand Central Station. As Blair explains, Trump landed a 40-year tax abatement, and &apos;a very, very favourable term&apos; for doing the refurbishing. &apos;He turned what had been a very classy but very old-fashioned place with a kind of limestone, traditional, laid-back look and demeanour, into a very glitzy, fancy, shiny, marble, reflective surfaces, chandeliers all over the place thing that was very different to what had happened before. [It] really made his name,&apos; says Blair. Guttenplan says Trump also displayed an incredible flair for marketing early in his career; particularly for marketing himself as a brand.However, he points out that the tycoon was never terribly successful as a real estate developer. &apos;He would go way out on a limb, he would overextend himself in terms of leverage, and then the company would have to declare bankruptcy. Or later, when he had the casinos in Atlantic City, he would be bailed out because he had this huge ocean of cash coming through the casinos and he could use some of that to cross-subsidise or to bail out his real estate operations,&apos; says Guttenplan. In 1987, on the back of his early success, Trump published The Art of the Deal, which reached number one on the New York Times bestseller list and held a position in the list for 51 weeks. More a celebrity memoir than a business manual, the media loved it. Guttenplan says Trump gained a reputation for being &apos;crack cocaine to the press&apos;. Just three years after The Art of the Deal was published, Trump found himself in financial trouble for the first time. He had overextended himself by as much as $1 billion, says Blair, although she admits that the numbers &apos;are awfully squishy with him&apos;. That personal brand he had built up, however, had made Trump too big to fail. &apos;The financial institutions that he owed money to couldn&apos;t really afford to let him go under because the things that they had invested in, that they had lined up to lend him money for, were not going to be worth as much if his name wasn&apos;t on them,&apos; Blair says. When Trump announced he was going to run in the Republican presidential race in June, many people didn&apos;t take him seriously. When he quickly became the Republican frontrunner, many were shocked. Steffen Schmidt, a professor of political science at Iowa State University, says it came as a total surprise. While there have been celebrity candidates in US politics before, Schmidt says Trump is a unique phenomenon. He points out that Ronald Reagan may have been a movie star, but he was hardly a political novice before his presidential win. What does Donald Trump&apos;s popularity tell us about the current state of American politics and about the 16 other candidates? According to Guttenplan, it exposes the death of America&apos;s core myth: that if you work hard and play by the rules you will succeed. &apos;You may not become Donald Trump but you will at least be able to live in a home that you own and send your kids to school and your kids will have a better life than you. There was a lot of truth in that myth for a very long time, but I think people don&apos;t believe it anymore. They can see that Wall Street executives bankrupt the country and then the rest of us have to bail them out, and then they are back to it again. Their salaries are the same; their bonus pool is the same size. Meanwhile people are still looking for jobs. Trump&apos;s campaign has not been strong on policy. Instead, the presidential hopeful has taken a hardline approach to issues that already appeal to many Republicans, like immigration and border control. After branding Mexican immigrants as criminals, drug dealers and rapists, he pledged &apos;build a great, great wall on our southern border&apos; (Trump expects Mexico to foot the bill for this wall). These provocative statements, combined with Trump&apos;s innate showmanship, have led to a flood of free media attention. As Schmidt points out, Trump has attracted more publicity than any of the other 16 candidates, without purchasing any broadcast or print advertising. The first Republican presidential debate aired recently, attracting 24 million viewers. It was the highest rating primary debate in history; just to put that into perspective, the first GOP primary debate four years ago attracted 3.2 million viewers. Blair spent many hours interviewing Donald Trump for her biography, and says that while he was very generous with his time and courteous, she always walked away feeling disappointed. &apos;I would have spent hours preparing lists of questions and he was just not responsive. He didn&apos;t answer them; he didn&apos;t seem to have any interest in talking about the past, in talking about what had shaped him. He had no rear-view mirror, he was only going ahead,&apos; she says.